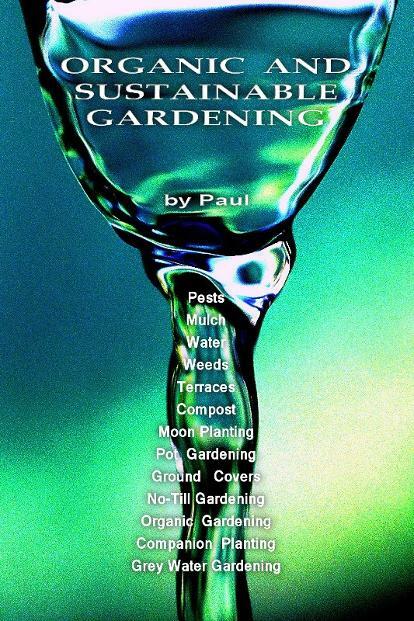 This site is an introduction to the basics of organic gardening, sustainable farming and natural land care. What are ground covers, mulch and compost and how are they used in the garden, farm and landscape? This information is aimed at people who have limited resources and hopefully can help them make the most of the little they have and recognize as resources things they may once have considered wastes and weeds. 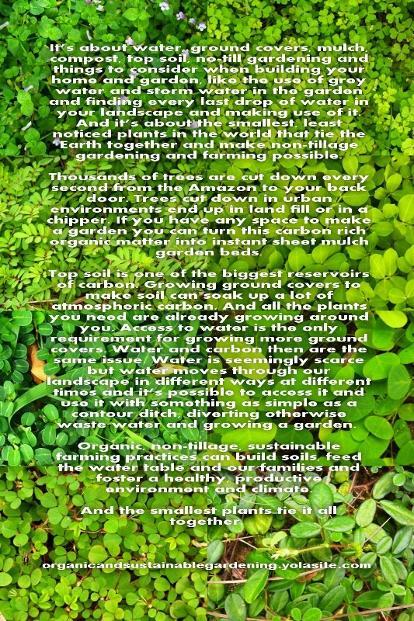 However anyone can find tips here that can help them to use water wisely and manage waste while improving the soil, securing harvests of a diversity of edible and useful crops and also create a healthy environment to live in. And beyond that there are wider implications for adopting organic and sustainable gardening and farming methods. The importance of good management of ground covers and the lands water drainage systems cannot be over stated. Ground covers are necessary to prevent erosion, maintain fauna and flora diversity and moisture content in the soil and to fix atmospheric carbon dioxide and store it in the soil as humus, as well as providing crops and forage for people and livestock. If you want to manage the flow of water, above and below the soil surface, it helps to have ground covers; if you want to grow ground covers it helps to have water. If run-off rain water can be invested in the upper reaches of the watershed, the land can be protected from erosion, water loss and drought; while the lower reaches of the catchment can be protected from flooding. In order to manage either ground covers or water it is an advantage to have control of both. Ground covers and water can be seen as the same issue and they are the focus of this website and book. For a long time now there has been a great deal of discussion about global warming, the greenhouse effect, climate change and erratic weather. But call it what you will, there are people who remain sceptical of these claims. So while the greenhouse debate rages, the discussion is distracted away from the more obvious damage the planet has suffered and the solutions. Because whether you believe in climate change or not, the unavoidable fact is that the deserts are growing, the forests are disappearing, clean water is becoming ever more scarce and top soils are being lost as farmers the world over are walking away from degraded land. And generally there is just less of everything to share with all the extra people who keep appearing on the planet. Increased CO2 in the atmosphere is not the only variable capable of influencing weather patterns. Loss of forest cover, top soils and ground water results in higher ground temperatures, lower atmospheric humidity, and decreased populations of ground cover generated airborne bacteria, essential for seeding clouds and triggering rain. Quite simply, chop down the trees and you chop down the rain. And in this simple equation we find the solution. Plant trees and bring back the rain. And consider this, top soil is one of the largest reservoirs of carbon there is. Using the power of the sun, plant chlorophyll takes CO2 from the air and fixes it into complex carbon chains like sugars, starches and more. Plants are consumed by animals and as both die and decay, their remains break down and the carbon once stored in them becomes mixed into the soil by more animals like worms and beetles. So loss of top soil is a burden on the atmosphere and assisting the creation of top soils is going to prove to be one the more effective methods of reversing rising CO2 levels. The current world economy has focused on industrial production which has encouraged huge population migrations with the promise of paid jobs. People have moved on mass from rural areas to urban areas overwhelming cities and creating enormous management problems for city authorities. This also creates huge wealth for those in a position to capitalize on large concentrations of people; but this is highly exploitive wealth and the majority of people do not see the benefits of it. In the developed nations we have an interesting situation where there is a growing number of people who view the industrial economy with distaste and would like to opt out if they can. But they are presented with the problem that land is expensive, degraded and generally depopulated; so an enormous personal investment has to be made to make land productive again with little or no community support to help them get back to a less consumptive life style. And harder still, few people have the skills necessary to make that all possible. Conversely poor people in developing nations are faced with the reality that living the life of a farmer is a life of poverty. They want an education for their children and hope to get, ‘a good job in Australia, in a mine, make $2000, one week’ as one Balinese man once said to me. Getting back to the land has little attraction in the developing nations, so many people the world over move to the cities seeking riches and sadly the majority of them just end up living a slum like life style, sadder and poorer than they were at home in the country. It is not till they are trapped in the slums that they realize what they have lost and then it’s too late. For those who do get an education and that good job, it does help them and their families in the short term but the end result is the continuation of the current exploitive global economy. So with the economic focus on urban areas, and the depopulation of rural areas, we see the growth of slums around our major cities and a serious decline in rural living standards as well. I suggest there is a serious problem with the way we run our economy and the way we perceive a rural lifestyle. So I submit to you that whatever the problems are, the solutions to them will turn out to be the same. Very simply we have to adopt sustainable agriculture and natural land care practices and gear our economy towards locally based production rather than the current global trade economy. The truth is that with good information, sound management principles and community support, it should be possible for everyone to live in relative health and wealth everywhere from the city heart to remote rural regions. And if that were the case, people would have no need to flock to the cities which would reduce the pressure on local governments and allow for better management and the sustainable growth of our urban regions. But there is still one major obstacle to overcome, the human mind. For a very long time now we have been scratching, digging and plowing the Earth. This age old habit is so deeply ingrained in us it is proving very difficult to overcome. This is because natural and sustainable gardening, farming and land care is the complete opposite of traditional stone-age agriculture in every way. Don’t dig, don’t pull out all the weeds and ground covers, don’t remove fallen leaves and branches from the garden, and don’t burn that organic stuff. In fact, go and get more of it to put in your garden. And productive plants should be grown in a multi-layered poly-culture rather than region sweeping mono-cultures that we see today. A lot of people find this form of gardening and farming very confronting and a challenge to accept and understand. So I beg you to consider that sustainable and natural farming and village technology scale production and problem solving are the answer to our current dilemma. In the end I believe that it will be the small solutions that will make the biggest difference to the problems that we face today like personal security and environmental degradation. If you want to fix atmospheric CO2, grow a garden, (with sustainable methods of course). A lot of information here will seem like very simple, common sense stuff but these are solutions to mistakes that are commonly made and they are mistakes that just don’t need to be. With just a little more thought in the planning stage a problem can be turned into a product; rain or irrigation water eroding the road could instead be channeled into the garden. Good design can make a big difference to your daily chores and your general comfort and productivity. If you’re inspired but not sure what to do I have gathered here as much information as I can on the subject of organic gardening, sustainable agriculture and natural land care to help you get started. I also include some links to related information on the net. It’s a really big field once you get in to it. I hope the information you find here will be of help to you. You are welcome to copy, download and print the information on this website for free. Above. The 'clean up' the morning after the party. Above. And this is where it all ends up. Believe it or not there is a canal under this pile. This was stacked against a bridge in central Chiang Mai, Thailand, the day after the first rain of the wet season. Not so long ago our springs, creeks, streams and rivers were the most beautiful, fertile and productive places on earth. Today ‘civilized’ man has left these places little more than gutters, drains and sewers. Above. Of all places I found this painting on the wall of the U.S. consulate in Chiang Mai, Thailand. It is one of many peace paintings on the wall painted by different Chiang Mai community groups. It's time to get back to nature. 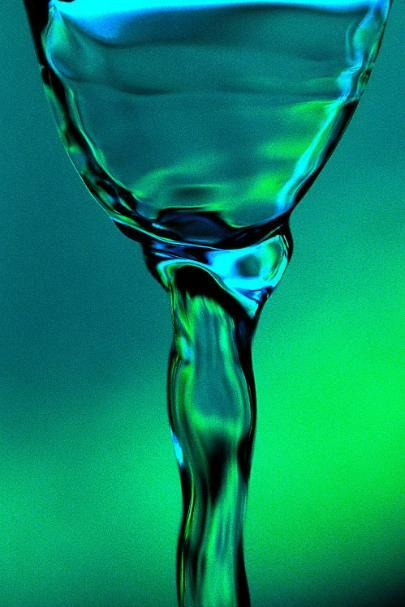 Above, the cover photo 'a glass of water' is a close up photo of water coming out of a kitchen tap. This is the critical moment, just before we use it and then let it run down the drain. What we do with it after it goes down the drain, will make this waste water into either an expensive problem or a valuable asset.